Microsoft Ignite 2018, which took place at the end of September, was packed with exciting news. A big focus of the conference was Microsoft’s plans for AI – and we were particularly excited to learn about the new Dynamics 365 AI apps! If you’ve missed the conference, we can help you catch-up! Here’s a summary of the main AI announcements and several useful links, including video sessions from the event. Artificial Intelligence (AI) was a big theme of this year’s Ignite event. New AI projects and products were announced, including new Dynamics 365 AI apps. These apps are all about improving the effectiveness of sales and customer service teams. The above links will take you to the product pages, where you will be able to see the details of these apps’ features. For more information about what’s to come for Dynamics 365, read the Dynamics 365 October update release notes. The Open Data Initiative launched jointly by Microsoft, Adobe and SAP. Its goal is to support companies’ use of AI. New AI features for Office 365: Ideas, which makes personalized suggestions to the user during document creation based on what they are doing. The Cortana Skills Kit for Enterprise will enable companies to create skills which will allow Cortana to complete specific business tasks. On demand Ignite 2018 sessions are available here. You can filter the videos by product, solution, session type or format. Or for a more detailed list of what’s to come, check out the Microsoft Ignite book of news. 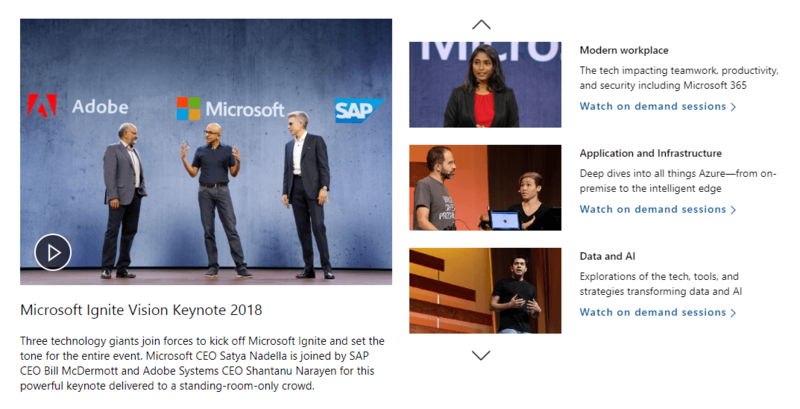 Many Ignite resources have been gathered on the Microsoft Ignite and Microsoft Envision 2018 page on Microsoft News. And for even more Ignite 2018 information, you can check out the Microsoft Ignite Blog.